Trump administration to ease restrictions on military drone exports–what does it mean? For some time now, military advisors to President Trump have been floating the idea that the exportation of military drones should be stepped up in order to keep the United States “in the game”, so to speak. Obviously, unmanned aerial vehicles (UAVs) are part of a growth industry, with drones of all shapes and sizes being produced and sold to people all over the world. Under Obama, lethal drone exports were strictly limited in accordance with what is perhaps best characterized as a policy of American Exceptionalism: Do as we say, not as we do. The technology has been spreading nonetheless all over the globe, with both China and Israel as major players ready and willing to furnish drones to countries not on Obama’s very short list of trustworthy customers. The Obama administration approach was to operate with a presumption against the exportation of lethal drones, but governments seeking this technology no longer need the United States to acquire it. To suppose that lethal drones would not eventually be hovering all over the globe, with or without the blessing of the executive branch of the US government, was shortsighted, to put it mildly. The dangerous precedent was set by the US government itself for the use of drones in wars on “battlefields” paradoxically “outside areas of active hostilities”, and now we can expect to see the true globalization of remote-control killing, across all borders, as lethal creep seeps into the protocol of governments large and small, democratic and monarchic alike. One of the figures promoting the expansion of drone exports has been, predictably, Secretary of Defense James Mattis, who, like so many other influential advisors to the president, has financial incentives for seeing to it that this facet of US military industry flourish. Initial indications suggest that the exports will be primarily of surveillance, not weaponized drones, but it is the very nature of a drone to be modular, so lethal delivery systems can be snapped on facilely by the customer. Needless to say, there will be no way to control how these machines are deployed by the end user, and at some point, the thin edge of the wedge will become the thickest, with untrammeled exports of fully weaponized drones as the norm–the argument being, again, that “if we don’t provide the lethal add-on, some other country will.” No one sells guns without ammunition and it seems predictable that drones will be regularly produced and shipped prêt-à-tuer in the not-too-distant future, given that the weaponized drone has already been successfully marketed as a tool of “smart war” in both the United States and the United Kingdom. Former US president Barack Obama and former UK prime minister David Cameron intentionally and premeditatedly hunted down and killed their own compatriots in acts of summary execution without indictment, much less trial. What reason can there be for believing that other political leaders will not also follow suit? If two of the most stable democratic governments on the planet have opted to substitute assassination for judicial process, why would the leaders of nondemocratic nations not take this as a license to kill anyone whom they perceive to be threats? People who see lethal drones as a growth industry are right: the market potential has only just begun. Who knew that Western democracies would revert to pre-Magna Carta times in their desperation to stem the tide of terrorism? That the use of this tactic, the summary execution without trial of suspects, along with whoever happens to be at their side, has failed spectacularly is evidenced by the very fact that the Global War on Terror (GWOT) continues to expand as terrorists proliferate and move to new places, sometimes seeking refuge in the West–which is of course the safest place for them to hide out at this point in history. Certainly jihadists concerned to retaliate to lethal drones hovering above their own neighborhoods in homelands in the Middle East have prudential reasons to pitch a tent somewhere else. The move to increase drone exports undoubtedly appeals to Trump, not because he himself is in cahoots with the lethal drone industry (at least not to my knowledge), but because he proudly proclaims that his primary mission is to Make America Great Again. Being first and foremost a businessman, Trump naturally measures “greatness” in economic terms. This explains why he has been exporting military weapons and technologies in a dizzying flurry all over the world, especially to the Middle East, but also to Southeast Asia. President Obama had set new records for military exports to Saudi Arabia but Trump, never to be outshined by Obama, has taken weapons exports to a whole new level. It is possible that Trump’s unabashed quest to out-do Obama on all fronts is a motivating factor in his increased use of lethal drones, the proliferation of hunt and kill missions, and also the decision to ramp up all military exports, including drones. I am inclined, however, to interpret all of this as following from Trump’s monolithic desire to make America economically great again. The more of these “tools” which are expended, whether in military missions abroad or in exports to other governments, the more there will be a perceived need to produce even more of them, using American capital and American labor. Greater production of weapons by Boeing, Lockheed Martin, Raytheon and the many other American firms whose wealth derives from the sale of implements of mass homicide will mean more profits. It seems safe to say that Trump does care more about the nation’s economic well-being than the fact that the number one US export has become, sad to say: death. But Trump’s heartfelt desire to revive the US steel industry and, ultimately the US economy, is merely aided by his massive increases in weapons exports. The end justifies the means. Let the missiles fall where they may. The way was paved for Trump’s increase in military drone exports by the resplendent success on the part of the previous administration in normalizing assassination and, remarkably, convincing people to believe that drone operators may in fact commit what would obviously be war crimes, if perpetrated by uniformed soldiers on the ground. For drones are used to kill suspects without providing them with the opportunity to surrender, even when they are unarmed and not threatening anyone with death, least of all the drone operator incinerating the target. As much as Trump detractors would like to blame the current president for the marked increase in drone-perpetrated carnage to come, the formidable feat of normalizing assassination was accomplished not by Donald Trump, but by Barack Obama. This was a landmark, paradigm-shifting, even revolutionary, rebranding of assassination as targeted killing, said to constitute perfectly legitimate warfare. No one should be surprised that, like US politicians, foreign leaders find lethal drone technology to be highly seductive. Targeted killing has proven easy to sell. More and more leaders will likely follow the US example, by insisting that lethal drones save the lives of compatriots, and obviate the need to sacrifice soldiers. But unscrupulous politicians and the leaders of nations where democracy has yet to take hold can use the very same rationalizations for killing suspects as did their mentors: political dissidents will be denounced as intrinsically evil terrorists and therefore fair game for summary execution. The myopia of the Obama administration in normalizing assassination without thinking through what were sure to be the ultimate consequences of insisting that the executive branch of a government has the right, in national self-defense, to execute suspects where and when it pleases, will emerge clearly in the years to come. For now, it seems safe to say that “strike first, suppress questions later” will characterize the approach to dissidents by more and more political leaders, all over the globe, thanks to the nearly boundless potential for profits in the death industry. The use of lethal drones to assassinate suspects will be limited only by the imaginations of politicians as they decide, behind closed doors, who does and who does not deserve to be extinguished by remote control. Eye in the Sky (2015) is the first feature-length film about drone warfare to have received a decent amount of mainstream attention. This no doubt has something to do with the high-caliber cast, including lead roles by Helen Mirren as Colonel Katherine Powell, and Alan Rickman as Lieutenant General Frank Benson. Big names imply big budgets. But there’s another reason why this movie, directed by Gavin Hood, has been discussed more than National Bird (2016), Good Kill (2015), Drone (2014), Drones (2013), Unmanned: America’s Drone Wars (2013), or Dirty Wars (2013). None of these films is entertaining. Eye in the Sky, like some of the others in this growing genre, presents itself as a work of historical fiction, grounded in what is supposed to be a realistic portrayal of the contemporary practice of drone warfare against persons suspected of association with radical jihadist groups. But rather than condemning the remote-control killers, as the other films unequivocally do, Eye in the Sky portrays the protagonists wrestling with the complexities of morality before launching missiles and then congratulating one another on their success. The “evil enemy” here, in Nairobi, Kenya, is Al Shabaab, and the fate of one of their cells is the subject of lengthy and sophistic “just war” debate among the drone warriors. A contingent of US and British military and civilian officials communicate with one another from different parts of the world over Skype-like video feed, and after arguing over the course of the workday, they ultimately decide to execute the suspects, who appear to be preparing to carry out a suicide attack in the proximate future or, as the drone warriors would say, “imminently”. One of the suspects is a US citizen, recently recruited from Minnesota, and two are British nationals. The white woman, Susan Danford—nom de guerre Ayesha Al Hady—has been tracked by Colonel Powell for a remarkable six years. Powell is keen to kill Danford, even after having summarized her life’s story as that of a person who came from a troubled household, married a terrorist, and was converted to the jihadist cause as a result of her vulnerability. The mission is supposed to culminate in capture, not killing, but when the group of suspects convenes at a house where a suicide vest is being assembled and a video message filmed, the military officials immediately call for a missile strike, to the initial protests of the civilian political officials in attendance, who insist that they are there to witness a capture, not a targeted assassination. The rest of the film is essentially an extended consideration of a version of what professional analytic philosophers call “The Trolley Problem,” a thought experiment wherein people are persuaded that they must kill some people in order to save others. Such hypothetical scenarios—like the proverbial ticking bomb, which is said by some to illustrate the necessity of torture under certain circumstances—involve an eerie desire on the part of some thinkers to persuade others to condone what, left to their own devices, they would never have agreed to do. As David Swanson has correctly observed, there is no known case in reality of drone warriors who kill a person and his entourage as they strap a suicide vest onto the martyr’s chest. That is why singling out this wildly implausible and entirely hypothetical scenario as representative of drone warfare in general is a consummate expression of pro-military propaganda. Eye in the Sky attempts to portray the dilemmas involved in drone warfare but ultimately serves to promote the drone warriors’ all-too-sophistic modes of reasoning. Rather than ask deep and important questions such as how Al-Shabaab became such a powerful force in, first, Somalia and, later, places such as Kenya, the film allows the viewer steeped in New York Times headlines touting “Six Suspected Militants Slain” to float along blissfully in his or her state of ignorance regarding what precisely the US and British governments have been doing in the Middle East for the past sixteen years. It is abundantly clear from the very fact that new recruits from the United States and Britain—indeed, the very targets of the mission in this story—have been primarily either troubled youths or persons outraged at the Western devastation of the Middle East, and now Africa. Yet the film blithely allows the viewer to persist in puzzlement over the perennial question: Why do they hate us? Both Colonel Powell and General Benson consider Susan Danford’s allegiance with Al-Shabaab to be, essentially, a capital offense. They don’t bother with niceties such as the fact that capital punishment has been outlawed in the United Kingdom. Instead, the military personnel seek refuge in and parrot the simpleminded terms of just war theory which they learned in first-year ethics class at the military academy. The missile strike is said to be a military necessity, proportional, and a last resort. It has furthermore been authorized by the legitimate authority, aka the US president, to whom the British continue to defer, even after the scathing Chilcot report in which Prime Minister Tony Blair was taken to task for embroiling Britain in the ill-fated 2003 invasion of Iraq. As though none of that ever happened, when President Barack Obama normalized the targeted assassination of anyone in any place on the planet where radical jihadist terrorists are said by some anonymous analyst to reside, Prime Minister David Cameron, too, followed suit. In August 2015, he authorized missile strikes from drones against British nationals in Syria, despite the Parliament’s having voted down his call for war in 2013. Perhaps Cameron was impressed by Barack Obama and drone killing czar John Brennan’s oft-flaunted fluency in just war rhetoric. Unfortunately, in Eye in the Sky, the sophomoric facility of the assassins with the terms of just war theory may, too, be taken as evidence to ignorant viewers that these people in uniform know what they are talking about and should be trusted with the delicate decision of where, when, and why to summarily execute human beings who have not been charged with crimes, much less permitted to stand trial. The question how a missile strike in a country not at war can be conceived of as a military necessity is altogether ignored in this film, as though it were already a settled matter. Someone in the US government (President Obama under the advisement of John Brennan, former president and CEO of The Analysis Corporation, the business of which is terrorist targeting analysis) decreed that the entire world was a battlefield, and this opened up every place and other governments to the delusive casuistry of just war theorists, including their most strident advocates for war, the self-styled “humanitarian hawks”. No matter that in this case there are no military soldiers from either the United States or Britain on the ground to be harmed. No matter that their collaborators are local spies who do in fact commit acts of treachery against their compatriots and are indeed brutally executed when this is discovered. Despite the complete absence of any of the aspects of a war which might warrant a missile strike as a military necessity—above all, that soldiers on the ground will otherwise die—the itchy trigger drone warriors point to their version of the dreaded Trolley Problem and a false and misleading application of utilitarianism to convince the naysayers that they must approve the launch of a missile in order to avert an even worse tragedy. The military personnel are more persuasive than the sole civilian dissenter, and no one seems to be bothered in the least by questions of strategy. The word ‘blowback’ is never even mentioned in this film. But judging by the growth of ISIS and Al-Shabaab over the past decade, and the testimony of suicide bombers such as Humam Al-Balawi (the Jordanian doctor who blew up a group of CIA personnel at Camp Chapman in 2009—in direct retaliation to US missile strikes on Pakistan), the tactic of drone assassination can reasonably be expected to cause the ranks of jihadists to continue to swell. No one denies that during the occupation of Iraq, an effective recruiting tactic of factional groups was to point to the civilians harmed by the Western infidels as confirmation that they were indeed the evil enemy. Knowing all of this, it does not seem unfair to ask: Is “military necessity” now conceived by the remote-control killers as whatever will ensure the continuation of a war? In Eye in the Sky, the drone warriors are more than willing to risk the life of a little girl who has set up a table where she is selling loaves of bread because, they say, if they do not act immediately then perhaps eighty little children just like her will be killed instead. No mention is made of the psychological trauma suffered by the people who do not die in drone strikes, but witness what has transpired. (When was the last time one of your neighbors’ houses was cratered by a Hellfire missile?) Instead, the collateral damage estimate (CDE) so conscientiously calculated by a hapless soldier pressured by Colonel Powell to produce an estimated likelihood of the girl’s death at less than 50% altogether ignores the 100% probability that she and everyone in the neighborhood will be terrorized. But even focusing solely on the likely lethality of the strike, the drone warriors in Eye in the Sky display what is in reality a lethal lack of imagination, an utter failure to conceive of counter measures such as warning the people in nearby markets and public places of the impending danger. That is because, in the minds of the drone warriors, if one terrorist attack is thwarted, then another will surely be carried out later on down the line. By this mode of reasoning, they have arrived at the depressing and nihilistic conclusion that they must kill all of the suspects. What would be the point of doing anything else? Recruits from Western societies, young people such as Junaid Hussain, Reyaad Khan, and Ruhul Amin, are assumed to be beyond the reach of reason, despite the glaring fact that their recent conversion to the jihadist cause itself reveals that they have changed their view before and could, in principle, change it again. Nonetheless, the drone warriors persist in their worship of death as the be-all and end-all of foreign policy. They are literally trapped in the lethality box, because they cannot conceive of any other way of dealing with factional terrorism than by killing people. When obviously innocent persons are destroyed, maimed, terrorized and left bereft by Western missiles, these acts of so-called military necessity end by galvanizing support for the Anti-Western jihadist cause, both near the strike site and in lands far away. Realistically, what self-respecting father would not wish to avenge the death of his young child at the hands of the murderous drone warriors who are so despicable as to kill without risking any danger to themselves? Instead of thinking through the likely implications of what they are doing, the drone warriors persist in invoking delusive just war rhetoric to promote what they want to do: kill the evil enemy. But the use of lethal drones in what has been successfully marketed to taxpayers as “smart war”, eliminates soldierly risk only by transferring it to civilians on the ground. No matter that new recruits continue to flock to the jihadist cause, seems to be the thinking of our great military minds, missiles are in ample supply. It is a depressing view of humanity indeed which sees homicide as the solution to conflict when in fact it is its primary cause. But the delusion of the drone assassins is even worse than the corruption of criminal contract killers because they emetically congratulate each other, as in this film, for pushing buttons to eliminate their fellow human beings from the face of the earth, as though this were some kind of accomplishment, rather than the worst of all possible crimes. New recruits such as Susan Danford will never stop arising from the ashes of drone strike sites until the drone strikes have come to a halt. Indulging in a false and Manichean division of people into black and white categories of good and evil, the killers corrupt more and more young people to collaborate with them, both informants and drone operators. Those who perform well in their jobs rise in the ranks to become the commanders of future killers, until at last the entire society is filled with people who upon watching a film such as Eye in the Sky end by sympathizing not with the victims but with those who destroyed them. Focused as they will be upon this simpleminded “Trolley Problem” portrayal of drone warfare, Western viewers will likely miss altogether the obscene hegemonic presumptions of the killers who use beetle- and bird-sized drones to penetrate the private homes of people in order to stop them from wreaking havoc in countries where there are no US or British soldiers on the ground to harm. To pretend that all of this killing is for the benefit of the locals is delusional to the point of insanity. If serial Western military interventions had not destroyed country after country across the Middle East, beginning with Iraq in 1991, then there would be no “evil enemy” to confront in the first place. To continue to ignore the words of jihadists themselves when they rail against the savage butchery of millions of Muslim people by the US military and its poodles is but the most flagrant expression of this smug hegemony. No, I am afraid, they do not hate us for our freedom. In Eye in the Sky, anyone who opposes the use of military weapons against people living in their own civil society thousands of miles away is painted as a coward and a fool, as though there were some sort of moral obligation to launch missiles to save a hypothetical group of eighty people. The very same killers do not feel any obligation whatsoever to provide food, shelter, and potable water to the people living in such societies, even when the $70K cost of a single missile could be repurposed to save many more than eighty lives, in addition to winning over “hearts and minds”. Here is the ugly truth shining through the willingness to kill but not to save lives in nonhomicidal ways: Peace does not pay. The drone killing machine is the latest and most lucrative instantiation of the military-industrial-congressional-media-academic-pharmaceutical-logistics complex. That Westerners continue to be taken in by this hoax is tragic for the people of Africa and the Middle East mercilessly terrorized (when they are not maimed or incinerated) while the killers gloat over what they take to be their moral courage. Near the end of the film, Lieutenant Colonel Benson sanctimoniously admonishes the sole remaining dissenter among the witnesses to the mission, which she has denounced as “disgraceful”. He smugly retorts to her suggestion that he is a coward: “Never tell a soldier that he does not know the cost of war.” But the cost of the remote-control elimination of persons suspected of complicity in terrorism is not merely the tragic loss of human life. It is the destruction of such killers’ souls and the concomitant creation of even more killers who feel the need to retaliate in turn. It is the fact that they have rolled back all of the moral progress in procedural justice made by human societies since the 1215 Magna Carta. It is the fact that their dogged insistence on perpetuating and spreading this practice to the darkest and least democratic corners of the planet represents a categorical denial of human rights. BBC Radio 4 Thinking Allowed. Drone Warfare: From Soldiering to Assassination? 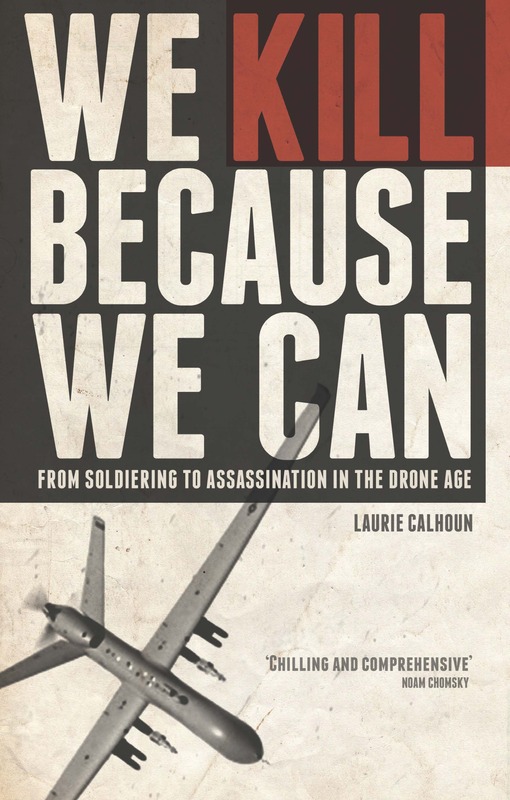 In this 17-minute discussion, BBC Radio 4 host Laurie Taylor interviews Laurie Calhoun and David Galbreath about issues raised in We Kill Because We Can: From Soldiering to Assassination in the Drone Age. Topics covered include the dawning of the Drone Age on November 3, 2002; its relation to the terrorist attacks of September 11, 2001; the international principles of justice being ignored and subverted as a result of this easy-to-use and seemingly low-risk technology; the effects on civilians; whether drone strikes are more about counterterrorism or foreign policy by other means; and the psychological effect of drone strikes on drone operators themselves. The study ended up taking four years longer than the projected two years, and it cost more than £10 million to carry out. The conclusions have been widely affirmed as damning of Tony Blair, the prime minister who chose to ally the United Kingdom with the United States in its invasion and subsequent occupation of Iraq. –The war was not a last resort. The UK joined the war effort before peaceful options had been exhausted. For the most part, the six year, £10 million+ study basically concluded what millions of antiwar protesters had no difficulty recognizing back in 2002. One topic which has not been addressed by any of the many commentators on the Chilcot Report—at least not to my knowledge—is whether it does not also mandate a reconsideration of the treatment of Britain’s allegedly treasonous enemies, young men who have turned against the UK government as a direct result of its complicity in the destruction of the country of Iraq, the deaths of hundreds of thousands of human beings, and the harm to millions more, many of whom were forced to flee their homeland as a result of the postwar violence and insecurity. I am interested specifically in the cases of three young British nationals, Ruhul Amin, Reyaad Khan, and Junaid Hussein, all of whom were incinerated by lethal drone while living in Syria, to which they fled in order to join the ISIS effort. The reason why the stories of these young men, denounced by the UK government as “evil terrorists” and threats to national security, trouble me is because they were deliberately destroyed by their own government without ever having stood trial or even been indicted for their alleged crimes. Two of the targets, Ruhul Amin and Reyaad Khan, were taken out on August 21, 2015, by missiles fired from drones by the RAF under the authorization of then-Prime Minister David Cameron. The third target, Junaid Hussein, was eliminated on August 25, 2015, by a US drone with the help of British intelligence. (Other persons were killed in a previous strike aiming for him.) All in all, August 2015 was a precedent-setting month for Britain, a nation in which capital punishment has been outlawed and which was not officially at war in Syria, where these British nationals were hunted down and killed. Two of the three alleged enemies of the state were 21 years of age at the time of their death; the third was 26 years old. They all died in late 2015, which implies that two of the targets were 9 years old when the UK government joined the ill-advised war on Iraq; the third was 14 years old. This means that they were children or young adolescents at the time of the invasion of Iraq. Their entire worldview was obviously affected by the war on Iraq, for they later decided to team up with whoever was fighting those responsible. In other words, if Britain had not joined forces with the United States, which would have made it very, very difficult for the war to proceed, as there would not have been a “coalition of the willing” but only a rogue aggressor state, then in all likelihood Iraq would not have been destroyed, and the group which came to be known as ISIS would not have grown and spread from Iraq to Syria. These are all counterfactual conditionals, of course. My point is only that if ISIS never came to be in its present form, because the people of Iraq were not subjected to oppression and lawless aggression—night raids, summary executions, detentions and torture—then the British drone strike targets destroyed with the blessing of David Cameron could not and would not have joined forces with the group now known as ISIS. I therefore find that, in addition to being responsible for all of the death and destruction in Iraq, Tony Blair bears responsibility not only for the deaths of Ruhul Amin, Reyaad Khan, and Junaid Hussain, but also for Prime Minister David Cameron’s summary execution without trial of these men. In saying this, I do not mean to absolve Cameron for his mistake, for he himself identified his victims as enemies of the state and arguably violated both British and international law by assassinating them. Cameron should never have followed US President Obama’s misguided precedent in summarily executing without trial his fellow citizens. However, Tony Blair is equally culpable, in my view, for having contributed to this return to a medieval, pre-Magna Carta framework of justice being perpetrated by unjust warriors as necessary only because of their own prior crimes and the existence of a sophisticated modern technology, the unmanned combat aerial vehicle (UCAV), without which none of these deaths would have occurred (see: We Kill Because We Can: From Soldiering to Assassination in the Drone Age). It is tragic that so many young Muslim men are being annihilated for reacting violently to what they correctly identify to have been atrocious crimes committed in a misguided war (see: Chilcot Report). The state warriors and the factional terrorists sadly all embrace the same confused premise: that conflict can be resolved by obliterating anyone who disagrees. Ruhul Amin, Reyaad Khan and Junaid Hussain are graphic illustrations of how young people are being molded into jihadists by their witness of state-perpetrated war crimes, and their heartfelt desire to stop them. On July 8, 2016, a robot was used for the very first time to blow up a criminal suspect in the United States. Five Dallas city policemen had been slain, and several others injured. The perpetrator, Micah Xavier Johnson, was involved in a conversation with the police for a while, but when he began shooting again, the decision was taken to blow him up. The opportunity was there, the bomb-disposal robot was already in the possession of the police, and who could complain, given what this particular suspect had already done? The robot used to blow up Micah Johnson was not a lethal drone, but it may as well have been. One might wonder how the police devised the idea of using a bomb-disposal robot to blow up a human being, but certainly the US drone program offers plenty of examples of the use of remote-control technology to incinerate, rather than capture, terrorist suspects. US citizens have grown accustomed to their government killing people abroad, but the decision to kill by remote control in the homeland was extraordinary in that no attempt was made to incapacitate the suspect instead. In recent years, it has become increasingly clear that policemen in dangerous scenarios often opt to shoot to kill, aiming for the heart or head, not the suspect’s foot or hand. However, it is not the role of the police to execute but to take into custody suspects so that their guilt can be determined by a jury of peers and, if convicted, an appropriate penalty applied. Despite the grisly nature of what was done to Micah Johnson, many commentators have insisted that the police chief made the right call in deciding to blow the man up. But was this in fact his call to make? The precedent set by this action would seem to be yet another step down an ever-more lethal continuum rendered considerably more so by the current US president, Barack Obama, whose policy it is to kill rather than capture suspected terrorists located abroad. The US administration continues to claim that in all of its thousands of targeted killings, capture has been infeasible and the premeditated, intentional acts of homicide have been necessary in national self-defense, all part of the Global War on Terror. Obama’s authority to kill suspects anywhere he chooses to do so—both inside and outside areas of active hostilities—is said to derive from the Authorization of Use of Military Force (AUMF) conferred by the US congress upon President George W. Bush about fifteen years ago. As technology has become more and more sophisticated, it is highly ironic that the restraints on killing wrought over millennia, and the great advances in institutions of justice, beginning with the 1215 Magna Carta, have been forgotten or set aside. The suspects killed in the Global War on Terror by lethal drone are presumed guilty until proven innocent, but they are denied the right to demonstrate their innocence. They are denied even the right to surrender and usually have no idea that they are about to be killed. They are simply eliminated from the face of the earth at the behest of the US president’s henchmen at a time of their choosing, as the “opportunity” arises. The blowing up of Micah Johnson by the police was triply ironic. Not only was he trained as a sniper by the US military, but the young African American was apparently protesting against police brutality against black men in the homeland. Johnson’s desire to “kill white people” arose out of anger at the police killings of a series of black men brought to the attention of the public by the Black Lives Matter movement over the past few years. But the response of the police to Johnson’s obviously misguided mission to target policemen was to ratchet up the brutality against black men yet another notch. Rather than being riddled with bullets, the body of Micah Johnson, a black man, was blown up in a manner befitting a condemned building, not a human being. In saying this, I do not mean to suggest that shooting to kill unarmed persons is somehow less objectionable, but only that the degree of sheer violence is much greater and the denial of the victim’s personhood highlighted by the use of a bomb to eliminate him. After the use of a robotic device to obliterate the suspect, several Dallas officials made public statements to the effect that there was no other way to neutralize the threat posed by Micah Johnson. I can think of several. How about bombing the place where he was located with tear gas? SWAT teams certainly have gas masks in their arsenal of equipment, so the place could have been literally fumigated with gas using the same robot to deliver not explosives but agents of lachrymation. Or how about bombing the place with a gaseous form of sedative to knock him out so that the place could be secured and accessed by a team who would then be able to take the man into custody? In this regard, the case of Micah Johnson bears comparison to that of Osama bin Laden, who was also executed when in fact he might have been shot with tranquilizer plugs rather than bullets. His unconscious body could have been lifted out of Abbottabad just as his corpse was, but the decision was taken by Obama to kill him instead. Bin Laden was widely reviled as the mastermind behind the terrorist attacks of September 11, 2001, and if not the architect, he was at the very least their inspiration, given his enthusiastic exhortations that Al Qaeda members wage jihad against the United States in retaliation to what he regarded as inexcusable war crimes, especially in the 1991 Gulf War and its aftermath in Iraq. The execution of Bin Laden and Micah Johnson are similar in another, even more significant, way. Both acts of killing look like exceptions, which took place in extraordinary circumstances. However, as precedents, both can be seen to set in motion a series of future actions modeled on them, because the exception swiftly transforms into the rule once initial inhibitions against intentional, premeditated homicide have fallen by the wayside. Under Obama’s greatly expanded drone program, which began in January 2009, shortly after the new president assumed his office, assassination of suspects has been rebranded as “targeted killing” and carried out primarily through the use of Hellfire missiles delivered by Predator drones. The drone program and the execution of Bin Laden were mutually reinforcing. If lower-level “foot soldiers” whose names are not even known may be eliminated by drone, then why wouldn’t Bin Laden be fair game for elimination as well? Both the drone program and the execution of Bin Laden served to inform a further escalation of lethality when US citizen Anwar al-Awlaki was executed in Yemen by his own government. Was Al-Awlaki anything like Bin Laden? Of course not. But Al-Awlaki was mythologized as an execrable bogeyman in the mainstream media to the point where most Americans came to believe that he was morally equivalent to Bin Laden. To this day, most people have no idea that Al-Awlaki spoke out against the crimes of 9/11. He was a voice of moderation at the time, calmly counseling the government not to make the mistake of acting in ways which could easily be misconstrued as waging a war on Islam. That was precisely what the US government proceeded to do. They invaded Afghanistan in 2001 and Iraq in 2003, despite the fact that most of the perpetrators of 9/11 hailed from Saudi Arabia, the government of which was given a free pass. Rather than focusing on those ultimately responsible for 9/11, the US government set out to harass Muslims such as Anwar al-Awlaki to such an extent, using both the FBI and foreign governments (in his case, President Saleh of Yemen), that in some cases the targeted suspects transmogrified into self-avowed enemies. Was Anwar Al-Awlaki an operational terrorist, or was he a propagandist and cheerleader of sorts for jihad? Whatever source of inspiration some of the apprehended perpetrators of terrorist plots may have drawn from Al-Awlaki’s sermons, the fact remains that they and they alone chose to carry out violent acts. The evidence supposedly convicting Al-Awlaki of the capital crimes allegedly justifying his summary execution without trial continues to be withheld on grounds of State Secrets Privilege under a pretext of national security. Exceptions quickly transform into rules when more and more agents agree to follow suit. Case in point: only a few years after Obama’s 2011 decision to execute Al-Awlaki by lethal drone, then-UK Prime Minister David Cameron chose in 2015 to eliminate two British nationals located in Syria using lethal drones. Now, apparently, this is what the US government and its allies do. Find people, even fellow citizens, who appear to be up to no good, and if they are located in a Third World country or war zone, then it’s supposed to be perfectly fine to execute them without trial. Just make sure that you use a missile so that you can call it an “act of war”. In the case of Micah Johnson, the Dallas cop killer who was blown up by a robotic device operated by remote control, people may say that he obviously deserved to die and the police had no intention of risking the lives of any more of their comrades. But there were other “suspects” identified at the time of the crime as well, who might also have been blown up using robots, were they available, and had those suspects been located. One fellow’s face was spammed all over Twitter. It turned out that he was not involved. What if some vigilante had taken him out, under the assumption that he needed to be neutralized? What if the angry Dallas police force had located that suspect and blown him up for the very reason that he adamantly denied having done anything wrong? He would have become the homeland analogue to collateral damage, now that the weapons of war are being used by law enforcement. The risk aversion of war makers steadily increased over the course of only a couple of decades to the point where sacrificing the lives of civilians on the ground “outside areas of active hostilities” has come to be considered perfectly acceptable among US leaders. These are places where deadly missiles are being directed toward suspected terrorists even though they are not threatening anyone with death at the time when they are killed, and least of all US citizens. Indeed, the targets are usually unarmed, located as they are “outside areas of active hostilities”. Given how the drone program inclined administrators toward killing rather than capturing Bin Laden, and given how the killing of Bin Laden then inclined administrators to kill even US citizen suspects by lethal drone, I predict a similar lethal turn in law enforcement in the homeland in the aftermath of the obliteration of Micah Johnson by remote control. It does not matter that his case was exceptional. The case of Bin Laden was exceptional, too. The same risk aversion seen among the “light footprint” war makers led by Obama will begin to infect police departments all over the United States as the commanders of men in blue become less and less willing to allow them to die, even when the risk of killing innocent bystanders will obviously increase. It is of course rational to attempt to protect soldiers and policemen. But is it not finally time to reconsider the infinite price in innocent life being paid in the quest to kill allegedly evil people, whose importance is given higher priority than anything else? Is this focus on death to the exclusion of all other considerations not the ultimate expression of nihilism? What is most remarkable of all about the myopic, glaucomic, and amnesiac paradigm of lethal centrism is that given the never-ending series of mass killings being perpetrated all over the place—in Paris, Brussels, San Bernardino, Orlando, Nice, Dallas, Baton Route, Munich—we now have ample evidence that this single-minded focus on lethality is not keeping people in the West safe. As a matter of fact, “Kill don’t capture” and “Strike first, suppress questions later”, the Obama administration’s signature policy, serves as an incredibly destructive example to lone wolf killers, would-be jihadists, and angry activists alike who emulate governments when they decide to take up arms and perpetrate mass homicide as a way of expressing their grievances. What’s Conspicuously Missing from the Big Bad Brexit Debate Drama? My informal survey yesterday of a random sample of the good people of the village of Burnham, Buckinghamshire, and my short random exit poll survey this morning both revealed a strong outpouring of support for Brexit. None of the people with whom I spoke struck me as racists, and most did not even mention the topic of immigration, though all signs point to immigration as one of the most important factors in voters’ decision-making on this historic day. Yes, for the first time in more than forty years, the British people are being permitted to weigh in on the wisdom of their country’s membership in the European Union. One of the most interesting things I noticed in chatting with these people was that they often began revealing their preference for “Leave” in a hesitant, hushed voice. Once they realized that I was not a Remain Shamer, some of them began pouring out their many concerns. I spoke with a nurse whose retirement was postponed for four years by the EU. I spoke with a woman with small children who had noticed that the National Health Service (NHS) had become difficult to access. Of course, the Tories are certainly in part to blame for that, but it does not help, she lamented, that there is so much competition for the already scarce social resources. A couple of people were angry about Prime Minister David Cameron’s doom-and-gloom “the sky will fall if we leave!” narrative. One person expressed offense at President Obama’s threat to the effect that Britain will go to “the end of the queue” for trade if they leave the EU. I got the distinct impression that Brits do not generally believe that Britain will suffer any long-term damage from leaving the EU, though they are aware that there will be bumps initially, whatever the outcome of the EU referendum ends up being. It seems obvious to most people that lots of nations are not members of the EU, as Britain was not before, and they are doing quite well. Many people (not only the people with whom I spoke, but elsewhere on the internet) have expressed consternation about the topic of trade, not knowing whom to believe. The bankers? The EU technocrats and political elites? Why in the world should it be more difficult for Britain to trade freely than to navigate the volumes of regulations pumped out by the EU? How could it be more difficult for small businesses to not have to comply with the edicts of Eurocrats before selling their products and services abroad? Of course, it is entirely possible that many people are really concerned above all about immigration but wish to avoid being associated with racists and far-right extremist groups. Some crazy person assassinated MP Jo Cox last week, and there was an immediate poll effect: Remain got a big boost, as did the markets. This happened because people were moved by emotions to conclude that Brexit advocates must be crazy people. Obviously, that’s a non sequitur of gargantuan proportion, but good luck explaining that to emotion-driven voters. Particularly in this debate, where scare tactics, fear-mongering, and appeals to emotion are everywhere on display. One thing is clear: no one with whom I spoke understands how the admission of an ever-lengthening list of new member nations is supposed to strengthen the European Union—which everyone on both sides of the debate appears to agree is a sinking ship. If all of the new members are worse off economically than the United Kingdom, then how can the new members possibly contribute to plugging the hole in the hull? This just seems like common sense to many people: How many Brits want to move to Croatia or Albania? I am guessing that the number is rather small. And so there is bound to be real concern among the British people about the projected increase in their population in the coming years. Some of these people may have racist fears, but the numbers alone are enough to cause one to pause. Moreover, the more member nations there are in the European Union, the less important becomes any single country’s voice, including that of Britain. Each time the EU grows larger, each member state (aside from the new inductees) automatically has less, not more, power. I am well aware that some advocates of Brexit are far-right racists, but others simply abhor bureaucratic, democratically unaccountable hegemons. One wouldn’t know it from scanning the acrimonious ugliness poured out by self-styled “liberals” on Twitter and Facebook, but there are some pretty solid progressive arguments for Brexit. My own honest puzzlement about this entire dispute is over the issue of immigration, but not in the way in which anyone else appears to be worried. To be perfectly frank, I have never understood how granting preferential status to fellow Europeans (most of whom are, I believe, Caucasians) is somehow less racist than treating all outsiders equally. This is a serious puzzle for me. Please step forward in the comments section to disabuse me of my misconceptions here, but how is it supposed to be less racist to permit unskilled Europeans to move freely throughout the European Union but not, say, Africans or Muslims from the Middle East? Everyone seems to grasp intuitively that this poster is abhorrent. But no one, as far as I have seen, is discussing how this picture was made possible. The truth is that the above picture of a mass of homeless human beings came about only because of fierce military intervention in the Middle East, with the United States as the primary perpetrator, but other Western nations, including the United Kingdom, also bombing Muslim nations on a regular basis, thereby catalyzing the exodus of large numbers of people, who quite naturally wish to preserve their own lives, as any rational person in their situation would. President Obama dropped more than 23,000 bombs on Muslim-majority nations in 2015 alone. Some were delivered by drones; others by manned combat aircraft. Either way, that’s a lot of bombs, and that’s a lot of “death from the sky,” to quote his speech at Hiroshima. Under Obama’s leadership, the United States is fighting wars and providing homicidal weapons to rebels in at least seven different countries in the Middle East alone. Small wonder that the populations of those lands have been leaving in a steady stream—or tsunami, as the case may be. What else can they do? Too bad they can’t come to the United States, because that is where all of those people belong, given the reason for their displacement. Only when the people of the United States begin to suffer the consequences of their government’s military intervention abroad will they finally be motivated to call a halt to the mass homicide committed in their name.